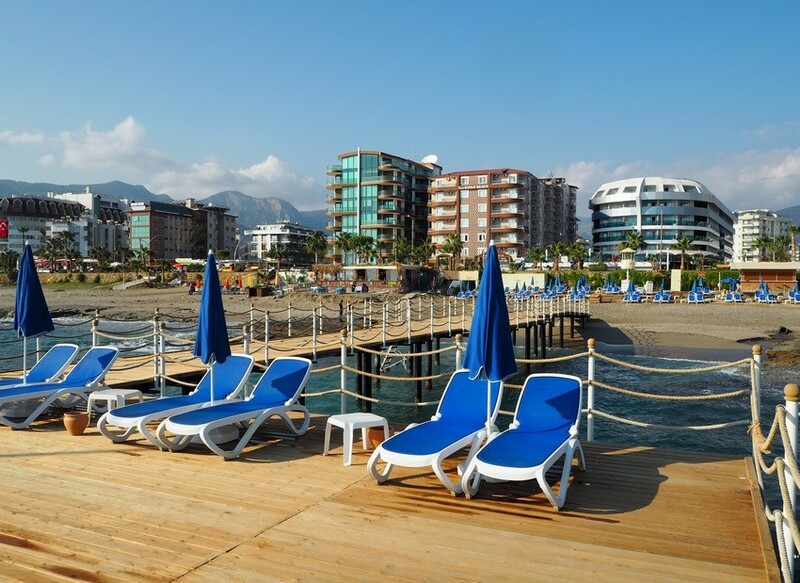 Are you planning a holiday in Alanya, Turkey? Check out this fabulous hotel, which will make your stay in this small region unforgettable. This year winter in Europe was quite cold and misty and I was really, REALLY excited to escape from it. Looking at possible regions to visit where the sun is already shining and one can enjoy the sea, I decided on visiting Alanya. Ever since a trip I made to Istanbul some years back, I have always been quite interested to see more of Turkey. 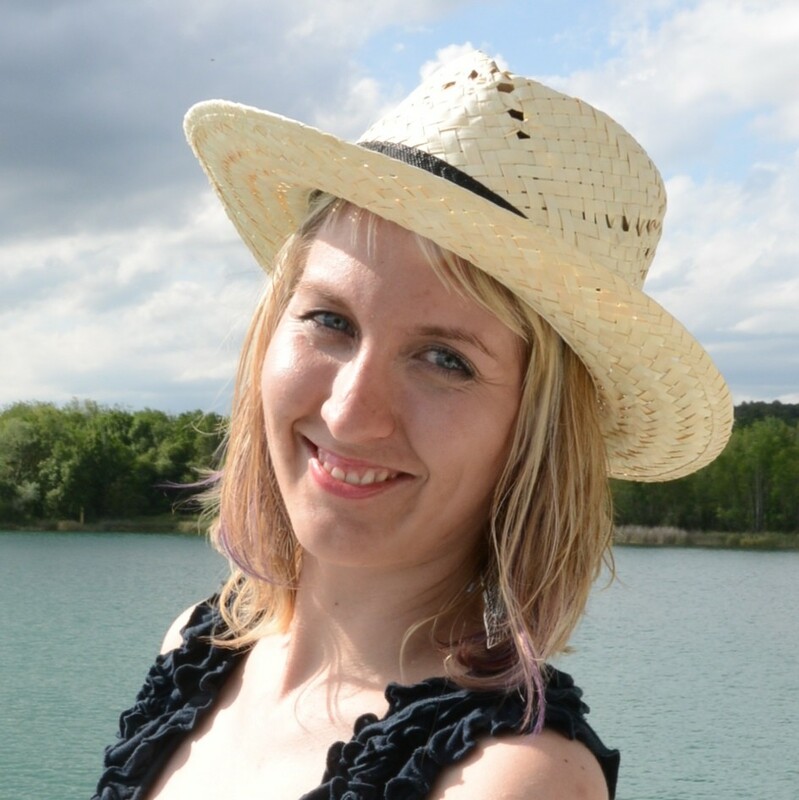 Together with my boyfriend, we tried various adventure activities that Alanya has to offer. I tried stand up paddle boarding for the first time, and for my boyfriend it was the first time to go paragliding. 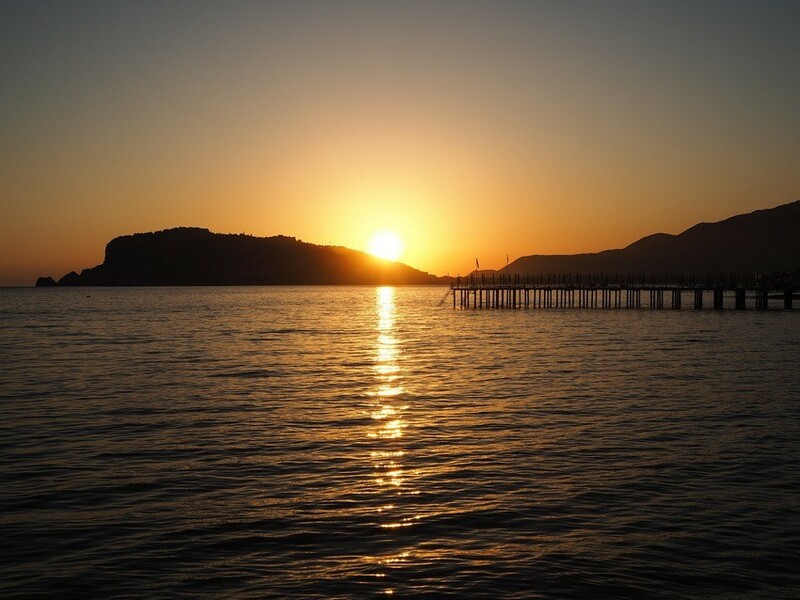 Make sure to check out my other blog post 10 Amazing things to do in Alanya, Turkey if you are heading there for your holiday. During our 10-day trip, we stayed at Sunprime C-Lounge, a five star hotel located directly on the beach. The hotel has great reviews online and you can be sure that it will live up to your high expectations. It is indeed an extraordinary place to stay – I wish I could have stayed there forever. Although most guests seem to travel in from the much further Antalya airport, this three-hour bus trip did not sound too appealing to us. We decided to fly in to the nearer Gazipasa airport instead. Check out flights on Kiwi.com to find the cheapest fares. We had to transfer flights in Istanbul, but there is nothing like arriving directly at your holiday destination. It only took 25 minutes to reach the hotel from the airport, passing through vast banana plantations that play an important role in the economy of the region. From the moment we entered Sunprime C-Lounge, we started to understand why it is that everybody on Tripadvisor seems to love this place. The hotel is spotlessly clean, with an impressive entrance hall featuring a giant glass lift up to the fifth floor. The service is outstanding, with people so helpful that all of your worries seem to dissipate. The hotel is only two years old, so both the facilities and rooms are new and modern. We checked into a room on the 5th floor which had a comfortable bed, LED flat screen TV, additional sofa, working table, and flawless bathroom. The rooms are kept clean, simple, and comfortable. I appreciated the ambient lighting and the fact that all the rooms feature a balcony. It really did make my day to wake up in the morning with my own sea view. The swimming pool area is artfully designed, with a pool bar and plenty of sun lounges and other cozy seats. In the evening, there is usually some musical performance which creates a lively and romantic atmosphere. The pool area as well as the beach is well maintained – you will see employees expending great effort to clean them throughout the day. If you have been to neighboring Antalya before, then you probably stayed in a hotel with a private beach exclusively for the hotel guests. 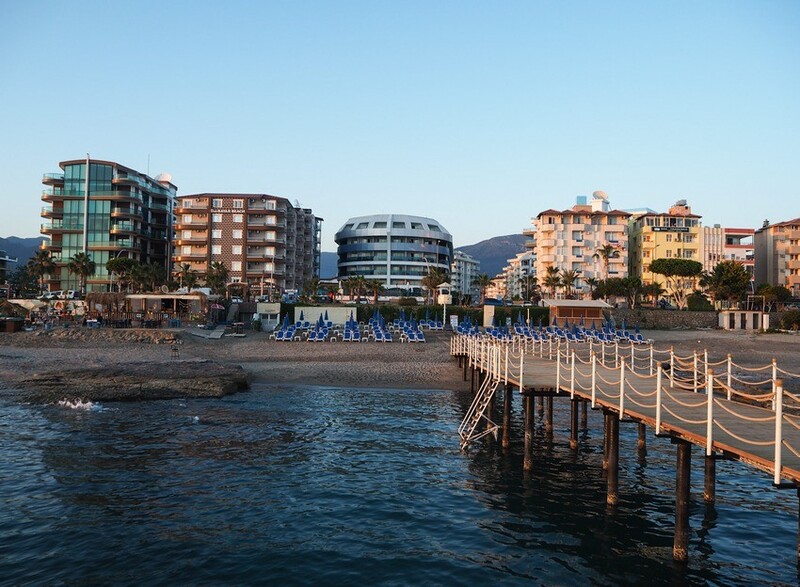 In Alanya, it is a bit different – there is a road separating hotels from the beach, and although each hotel gets a piece of the beach to care for, the front part is always public and anybody is welcome to access it. From Sunprime C-Lounge, you can easily access the beach via a tunnel. It is a sandy one, however the shoreline has some rocks. It is a good idea to have underwater shoes. I always entered the water using a ladder from the pier and it was no problem at all. The water is clear, but not too interesting for snorkeling. 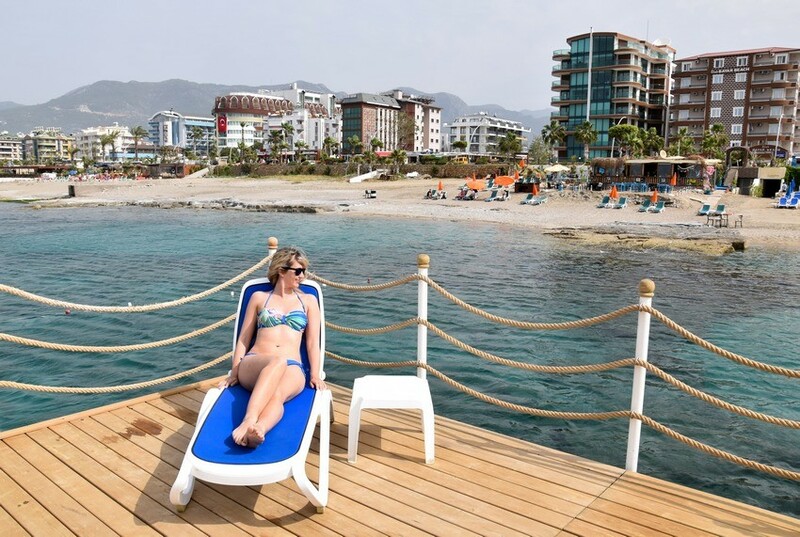 The pier that is provided for hotel guests features lounge chairs that are pretty much the best spot in the whole hotel – I loved to sunbathe there with the sound of the sea all around me! Sunprime C-Lounge is an all-inclusive resort and I bet you will like the food. 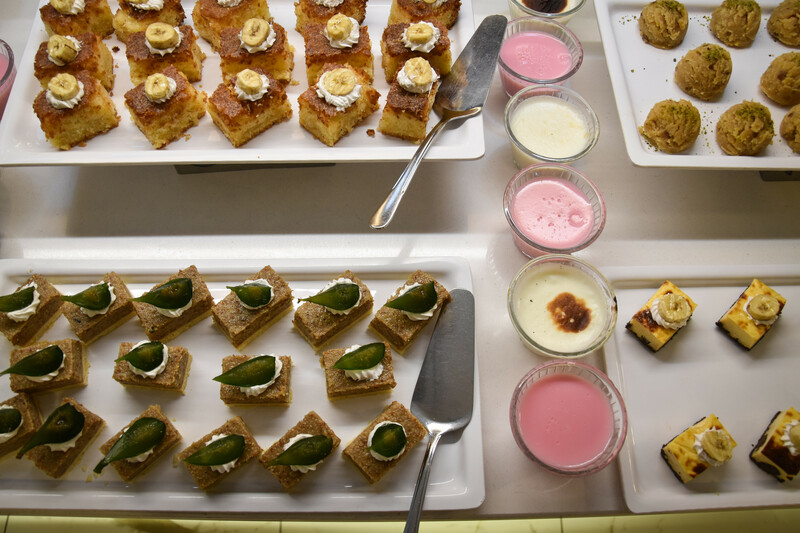 The breakfast, lunch, and dinner are served buffet style, with lots of variety. You may taste, for example, Turkish kebab (so tasty!) and there is a great salad bar with many delicious and healthy choices. I tried to stay away from the appealing dessert corner, and usually opted for fruit instead – I loved the fresh strawberries that tasted better than any I’ve had before. What I could not resist, however, was the ice cream stand down in the café – I stopped in there nearly every day, I must confess. The waiters in the restaurant are very helpful and willing – they always try to bring your drinks out for you to you table. 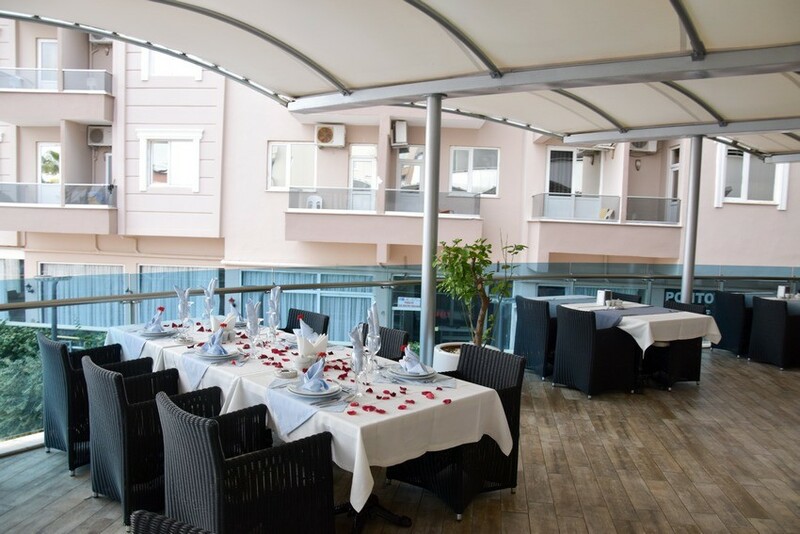 For special occasions, the tables are decorated in a romantic style with rose petals and candles. 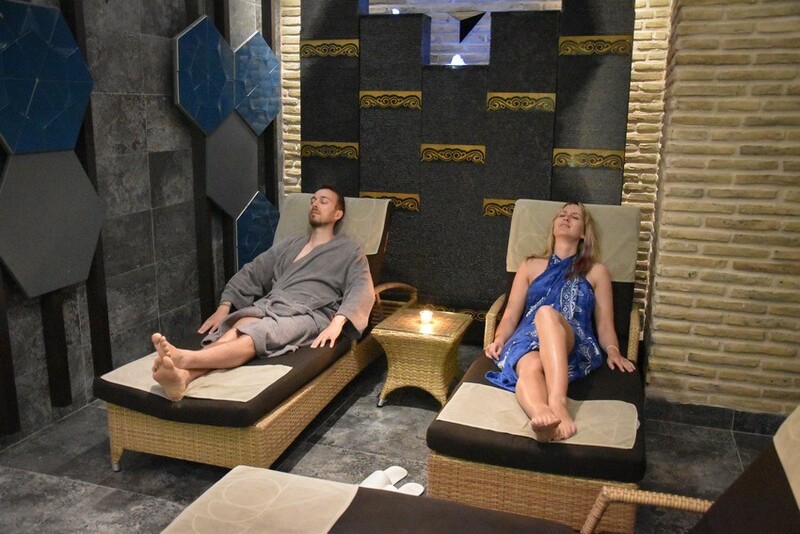 The hotel spa offers a great opportunity to relax, Turkish style. Basically the whole basement area is dedicated to the spa: there is sauna, steam room, massage rooms, and relaxation area. Perhaps the most impressive feature is the hammam room, which is made entirely of marble, including the central platform raised above the heat source (called a göbektaşı). My boyfriend and I experienced the full two-hour treatment, including a whole body massage, body scrub, and a facemask. We were in absolute bliss! Although the procedures are not cheap, you get what you pay for. The best thing is that one does not even need to leave the hotel – you can arrive in bathrobes comfortably from your room. Sunprime C-Lounge is not a large resort, but all of its facilities are top-notch. It feels private, modern, and cozy – and all of this combined with great service makes for a perfect place to spend a holiday. There is so much more I could stay about Sunprime C-Lounge. My experience was indeed very positive; the time I spent there was definitely the best 10 days of this year so far. Moreover, it was wonderful to share the experience with my boyfriend. One day, we will be back for sure! Thanks for reading! If you enjoyed the article, I appreciate sharing! My stay at Sunprime C-Lounge Hotel was complimentary. My trip was in cooperation with Alanya Tourism & Promotion Foundation, Turkish Tourism Ministry Zurich Culture and Tourism Attache Office, and Turkish Airlines. All opinions are, as always, my own. Well the food was really amazing. Even the salad bar was quite stunning, so I have tried to spend there more time than in the other sweet corner. Sounds like a brilliant trip, and a wonderful place to stay, Veronika. I’ve travelled through Turkey but never stayed at a beachside resort, and definitely want to. This property looks nice because of the design and the pool. Definitely a 5-star. Hi Carol, yes I think this place is something for you. I know you are all into luxury. Definitely go for this hotel if you have some more time on your next Turkey trip! Alanya looks fantastic and looks look you had a great time. Love the looks of that swimming pool and its pattern. So could do with some relaxation and would consider staying here. Such a pretty spot! 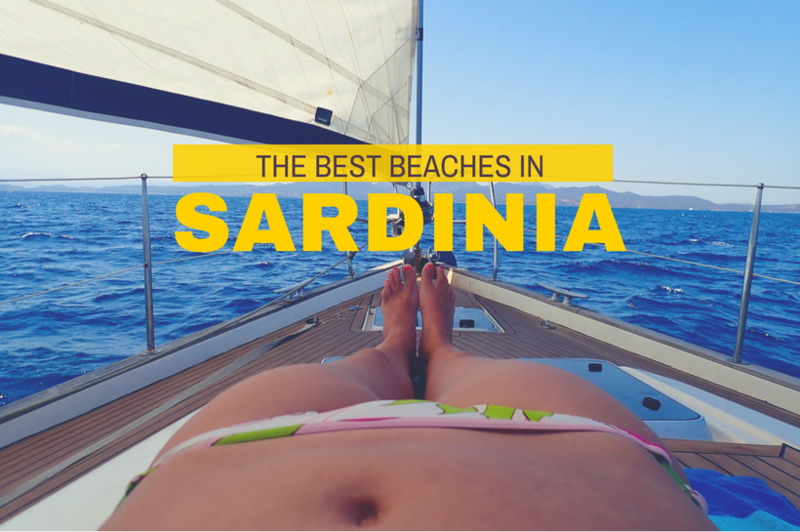 I always think more of Istanbul and cultural/adventure hot spots in Turkey that I forget about the beaches! I must admit, though, I’m not sure I’d be able to pull myself away from the spa. A 2-hour treatment would leave me a total (smiling) noodle. 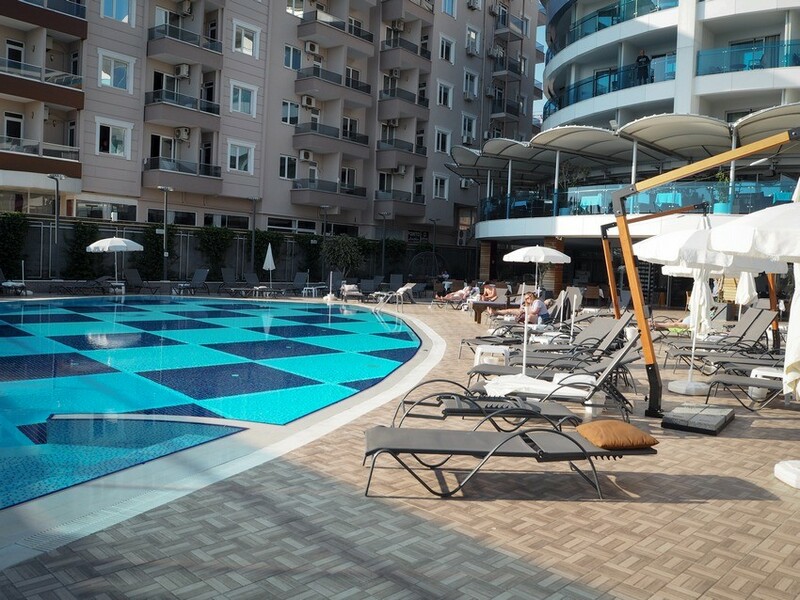 I’ve only been to Istanbul but need to explore more of Turkey I will keep this resort in mind when I expand my travels through the country as it looks great! Hi Candiss, yep, this is totally the most photogenic resort in Alanya. What a beautiful part of Turkey. You are incredibly lucky. I’m yet to visit Turkey but it’s certainly on my bucket list. The sunset in the final photograph is simply beautiful. Thanks Mike. 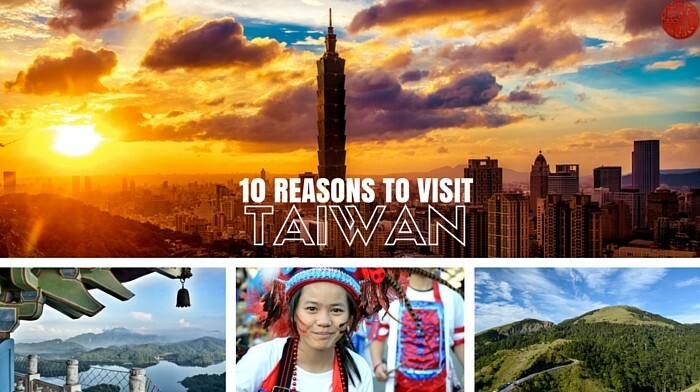 Its a good place to visit for sure! The hotel looks luxurious , to say the least . 10 days in a place like this is surely a dream… The pool and the Spa is so inviting. I have traveled to Turkey but stayed in the heart of Ankara before moving to other smaller cities. I guess next time I shall make it a point to check this out. It is 5 star resort and was build just 2 years ago, so all is pretty new and inviting. Recommended! I love Turkey! This place looks gorgeous. I’ll actually be in Turkey at the end of the year so I’ll have to keep this place in mind. Definitely! And keep in mind that you can fly directly to Alanya. Sunprime C-Lounge sounds incredible – I love how modern and clean the whole property looks – your photo of the pool area is probably the most well kept pool I’ve seen! 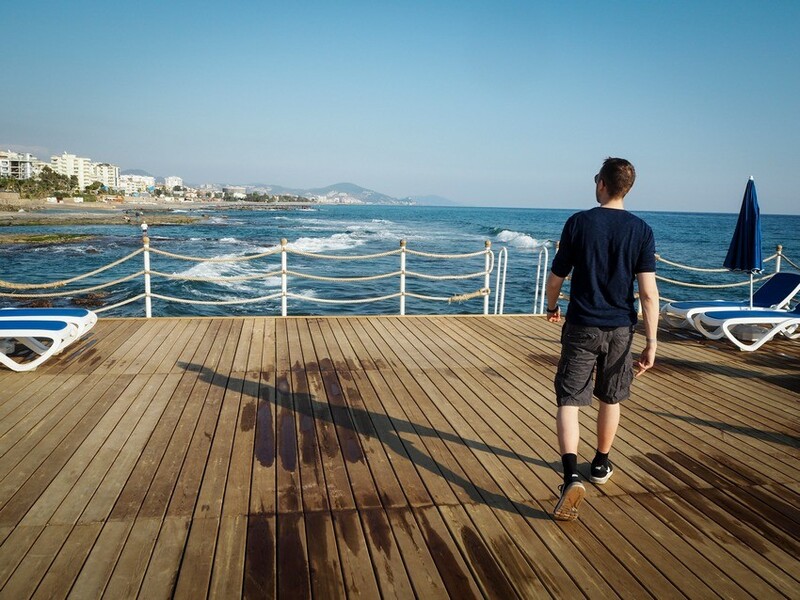 Though I would probably spend most of my time on the pier … though the sea views from the room look incredible too! Too hard to choose lol! Thanks for the heads up on underwater shoes, and the spa; visiting Turkey is an excellent excuse for a spa treatment as you can claim Turkish spa is a new cultural experience :D!!! This looks like the perfect place to spend a few days away from the hustle and bustle. The fact that each room comes with a balcony is a huge perk, and I love that there is nightly live music at the pool bar. I think I’d really enjoy lounging in one of those chairs by the pier. I am sure you would enjoy this resort – there are various bands playing every day. And once there was a DJ.